Is it the case that colours dim as the eye grows elderly? Or that our capacity to appreciate bright pigment diminishes as our youth and excitement about the world surrenders to experience? At over eighty years of age, Lilly Ulah’s display of glowing canvases at Raft Artspace in Alice Springs confronts the tendency to couple physical frailty with colourlessness. Faded, dull, paling, lackluster or dim are words that connote age; while vivid, bright and shining mark the spiritedness of youth. When the Coober Pedy Arts Project began their workshops in 2010, no one could have predicted that the most brilliant participant to emerge would be a resident of Umoona Aged Care; a woman without any technical arts training. Lilly’s paintings are quite literally brilliant in their display of colour. They dazzle, they entice; they make you lick your lips. At Raft over thirty canvases line the walls like gemstones. Knowing that they were created in Coober Pedy, I imagined I was inside a giant opal, mined from the Umoona earth. 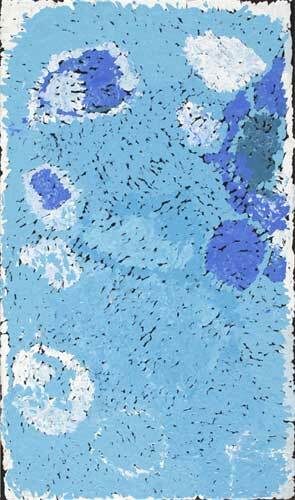 However, unlike the tinny tints and hard translucent glints found in an opal, Lilly favours an opaque palette. Opacity, together with her dense layering of paint, has the effect of making both her paler and her darker colours appear creamy and thick, exuding both delicacy and strength. Complemented by her use of soft shapes and asymmetrical compositions, Lilly’s warm palette of pinks, oranges, blues, purples and yellows appears buttery; the generous dollops of paint drips over the edges of her canvases like icing on a set of cakes. Looking at them was hungry work and, fortunately for visitors, Raft had prepared a table of homemade treats as part of the opening celebration. 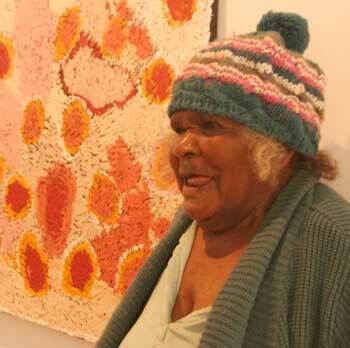 How Lilly emerged as an artist with a debut exhibition in Alice Springs is an interesting story, telling of the successful collaboration between two organisations working in the service of Aboriginal people: Adelaide-based program Ananguku Arts and the Umoona Aged Care facility in Coober Pedy. Ananguku Arts has been delivering professional development workshops for Aboriginal artists in the Coober Pedy region since 2010. 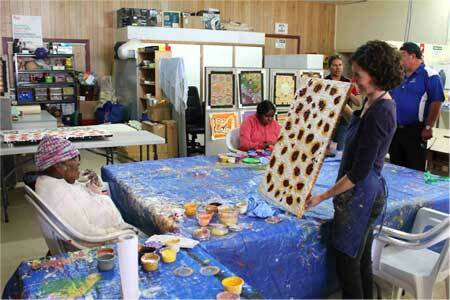 In 2012 regular workshops were funded as part of a feasibility study into the establishment of an art centre in Coober Pedy, funded by the Office Of The Arts (OFTA) and FaHCSIA. Over fifty artists participated between October 2012 to June 2013. The fruitful collaboration may seem an unlikely one – Ananguku Arts is oriented towards providing the opportunity for people to realize a new, positive chapter in their lives, while aged care often finds its purpose in guiding lives through what is usually their final station. On the other hand, the two organisations share a common purpose: to give people in need a more affirmative and engaging experience of the world around them. On this basis the two programs resonated and drew strength from one another. According to the Coober Pedy Arts Project Report, Umoona Aged Care staff commented that “some clients who they found difficult to engage in other activities had surprised them by the level of their involvement in the art workshops”. And the report concluded that, ultimately, “the most prolific artists were clients of Umoona Aged Care and their work was of the highest quality”. Eager explained that while the workshops facilitated Lilly’s art production, her style and technique are self-determined; Lilly chooses her pigments, mixes her palette, and tailors her tools. Eager believes that the intuitiveness of her relationship with colour and texture is evident in the paintings themselves, and that this forms part of their ineffable appeal: “People pick up on that,” he says. He believes Lilly’s lack of technical knowledge gives her process a “spontaneity” that raises her work to the level of “pure art”. 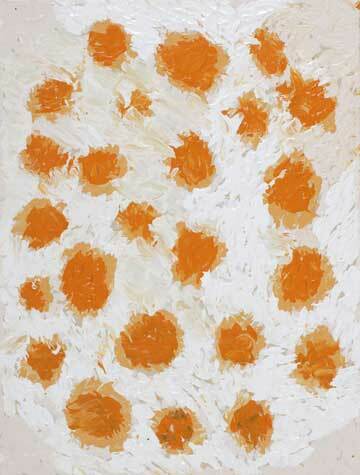 Lilly’s works are the product of time spent joyfully, and this certainly does shine through. At the opening, Collin and Eager delighted in the success of the project. “It’s achieved what it was intended to do,” Collins reflected. The pair are hopeful that the success of Lilly’s show will also enable the project to secure further funding from the federal government, and from private philanthropic or arts bodies. At the opening, Lilly sat silently in the centre of the room, occasionally smiling and giving a thumbs up. Without speaking any English, her ability to communicate with visitors to the gallery was limited. However, the universal language of colour is one that she speaks fluently, and it was through this prism that we all communed with her on Saturday. It seemed to me that Lilly declared herself loudly and proudly, simply by choosing to attend her opening wearing an ensemble of greens: the only colour absent from her paintings. Note: Anna Georgia Mackay is doing an internship at Alice Springs News Online. I agree with all the other comments about this article. This art is sensational! Thanks for the great article and the photos Anna Georgia! Anna Georgia Mackay has the soul of a seasoned art critic. Her fluent style of narrative journalism is just what the modern media is aching for. Anna Georgia Mackay is clearly a writer of great promise.